Part of the Apache Trail dirt road follows along the edge of the Salt River. There are many scenic drives in the USA and one of the great American scenic drives is Arizona’s Apache Trail. In addition to the natural beauty of this desert trail, travelers will be able to visit some great sites including Goldfield Ghost Town, Tortilla Flat, Roosevelt Dam, and Tonto National Monument. 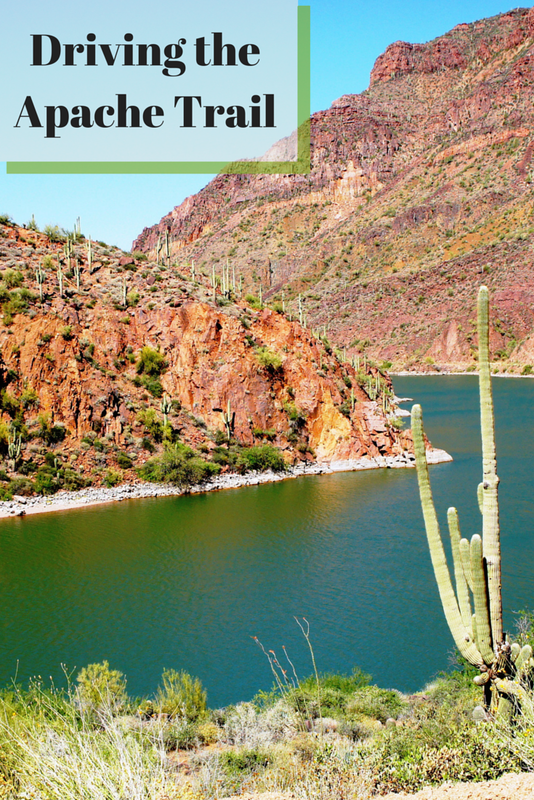 The Apache Trail is easily reached from Phoenix, Arizona and runs as Highway 88 for approximately 80 miles from Apache Junction, past Apache Lake and Theodore Roosevelt Lake, to the Highway 60-70 junction. Most travelers turn the drive into a loop, returning to Phoenix via Highway 60. Native Americans used the Apache Trail as a migratory route. Later the road was used to haul construction materials from Phoenix to the Roosevelt Dam. Construction of the road was started in 1903 and the Tonto Wagon Road was completed in 1905. After the Roosevelt Dam was completed in 1911, the Apache Trail became a tourist attraction. The Apache Trail will be celebrating its 100th anniversary in 2015. Blooming saguaro cactus along the Apache Trail. We left Phoenix, heading east, passing saguaro cactus, driving along the Superstition Mountains, to reach our first stop along the Apache Trail, Goldfield Ghost Town. While Goldfield Ghost Town is by all definitions a tourist attraction, it used to be a real town. Goldfield became a town in 1892 when they hit gold. In addition to Mammoth Gold Mine, Goldfield had three saloons, a general store, a boarding house, a blacksmith shop, a brewery, a meat market, and a school house. Goldfield Ghost Town's Mammoth Saloon. Today Goldfield Ghost Town has a number of attractions for visitors. We started our time riding the Superstition Narrow Gauge Railroad, a 20-minute journey along a mile-and-a-half of track circling Goldfield Ghost Town. Our train conductor Whiplash provided us with the history of Goldfield and the Superstition Mountains while we rode the rails. Henry and Charlie waiting for the train. Next we took a tour of Goldfield Mine. The Goldfield Mine Tour takes visitors underground in a mineshaft where gold mining equipment and procedures are explained. A combined ticket to the train, Goldfield Mine, and Mystery Shack can be purchased, so after our tour of the Goldfield Mine we entered the Mystery Shack. While the Mystery Shack is really more for kids, we still had a lot of fun trying to walk at a 45-degree angle and watch objects seemingly roll uphill. Learning what it was like for the gold miners. The Mystery Shack, because why not? All of the experiences we had in Goldfield Ghost Town were dog friendly. There are a number of other things to do in Goldfield Ghost Town including the Superstition Zipline, Goldfield’s Historic Museum, Goldfield Livery Stables, Lu Lu’s Bordello at Goldfield, and Gold Panning at Prospector’s Palace. After Goldfield Ghost Town we stopped at Tortilla Flat for lunch. Tortilla Flat is the remains of an old stagecoach stop. Superstition Saloon and Restaurant has barstools made of saddles, wallpaper made of customers’ dollar bills, and serves some great chili and burgers. Be sure to stop in next door at the Country Store for their famous prickly pear ice cream. The dollar bill wallpapered Superstition Saloon and Restaurant. About five miles past Tortilla Flat is where the Apache Trail gets a little hairy. The road turns from paved into dirt, narrows, and becomes windy. Living in Southern California we have a lot of experience with windy roads running along steep mountains, but we could see how this road might be scary for travelers coming from places with flat roads and few hills or mountains. But if you’re a brave driver and have a car made for the trip, this scenic drive offers some beautiful desert and river vistas. The Apache Trail turns into a dirt road winding through the Arizona desert. The Apache Trail follows along a branch of Salt River continuing on to where it connects to Theodore Roosevelt Lake, separated by the Theodore Roosevelt Dam. The Roosevelt Dam was at one time the world’s tallest masonry dam and was built to control the flow of the Salt River and allow for irrigation of the Arizona desert so the land could be farmed. Just behind the Roosevelt Dam is the Roosevelt Lake Bridge, the longest two-lane, single-span, steel-arch bridge in North America. The bridge was built to take traffic off the Roosevelt Dam, which is too narrow to allow two-way traffic of modern-day vehicles. Not far past the Roosevelt Dam is Tonto National Monument, the site of Salado cliff dwellings. There are two sets of cliff dwellings, the Upper Cliff Dwelling built around 1300 AD and the Lower Cliff Dwelling. Reaching the Lower Cliff Dwelling involves a half-mile hike uphill from the museum. Dogs are allowed on the trail and can be carried through the dwelling, but are not allowed to walk through the dwelling. The Upper Cliff Dwelling is reached by a three-mile roundtrip hike and requires a reservation. Be cautious. We ran into a baby rattlesnake on the trail. The Lower Cliff Dwelling of Tonto National Monument. The Apache Trail scenic drive will take all day. We started around 9:00 in the morning and arrived at Tonto National Monument in just enough time to visit the Lower Cliff Dwelling before the park closed. 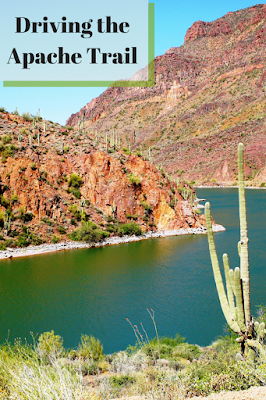 The Apache Trail is one of America’s great desert scenic drives providing little peeks into America’s Native American, gold mining, and stagecoach history.